But alas, it is not to be. Not only is the “hiatus” not as pronounced as it has been reported to be, but the research indicates that it is no more than a brief redistribution of the increasing heat in the Earth system from the atmosphere and ocean surface to the deep ocean. There is no joy to be found in the “hiatus”. We’ve all heard about the “hiatus”, this purported “pause in” or even “end of” global warming. And a quick look at a typical graph of global surface temperatures is certainly suggestive. 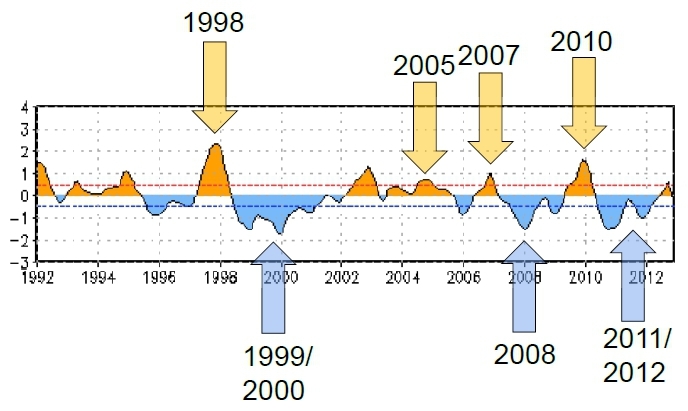 But how does the picture change if we separate out El Niño years and La Niña years (which together make up the ENSO cycle, explained here) with accompanying trend lines? Thanks to the masters of climate animations at SkepticalScience.com – Source. Suddenly, the upward trend doesn’t seem quite so abated. And if we look at an indicator of El Niño vs. La Niña conditions, we see that the post-1998 period has been dominated by La Niña (the negative areas in the graph below). So, if La Niña years tend to be cooler than El Niño years, it becomes rather less surprising that surface temperatures have not been increasing as fast during this recent period that’s been dominated by La Niña conditions. Not only that, but consider — despite the dominance of La Niña, we continue to have some of the hottest years in recorded history! In addition to the impact of the ENSO cycle, it’s also likely that the geographic distribution of where we sample temperatures may have been biasing our “global” temperatures down. The is illuminated in a paper by Cowtan & Way 2014 (available free here – thank you Wiley!). The VERY simplified version is that different parts of the globe are warming at different rates, and that our temperature sampling is less thorough in those arctic areas where the warming is greatest. As a result, typical reconstructions of global surface temperatures are biased lower because our temperature sampling is more concentrated where the warming is less pronounced. Cowtan & Way use an alternate means (kriging – don’t ask me to explain) of reconstructing the global temperature that shows a higher trend than the conventional methods. The esteemed Tamino discusses their paper in much more detail here (rather more accessible than the original Cowtan & Way…). And let’s return to Tamino for one last piece of the puzzle (see A pause or not a pause, that is the question.). How significant is whatever “hiatus” we have seen? Well, not very. Here’s a graph the demonstrates that pretty well. Thanks to Rob Honeycutt of SkepticalScience.com, who posted this animation of a series of three graphs by Tamino. He has a lot more in his article, so please check it out. Yeah, recent temperatures haven’t been increasing as quickly, but they’re just a little below the trend line. It looks like a hiatus because those below-trend years follow some more substantially above-trend years. Anyone that is too perturbed by, ahem, relatively minor perturbations above and below the trend line of a complex system needs to think things through a little harder. If surface temperatures have been increasing a little more slowly than in previous decades, we really have two basic possibilities to address: that heat has been accumulating in the Earth system more slowly or that the increase has continued unabated but is going somewhere our surface temperature measurements aren’t detecting it. We have little evidence of the former, but plenty of evidence of the latter – that more of the heat accumulating in the system is finding its way into the deep ocean. A really good summary of the model-based evidence of this can be found in a talk given by Dr. Gerald Meehl (of the National Center for Atmospheric Research in Boulder, CO) at the recent American Meteorological Society meeting. Here’s a video of his talk (and a related paper). And here’s a brief discussion of it on the AGU blog: Finding The Missing Heat- A Science Based Detective Story. In short, Dr. Meehl and team looked at iterations of climate models in which there were periods of flat to negative temperature trends (a little more on those below) and determined where the heat was going in those runs. What they found was that during hiatus years, more of the heat was going into the deep ocean (the two right-hand sets of bars below) while the radiation imbalance at the top of the atmosphere was all but indistinguishable (left-hand set of bars). Graph linked from SkepticalScience.com – Source. But that result is only as good as our models are at actually reflecting the Earth climate system. Is there anything else to lend it credence? As it happens, yes. The sea surface temperature patterns displayed in those model runs are similar to what has been observed over the past decade or so, suggesting that the models are doing a reasonable job of representing the climate system. An article by England et. al. (see a guest post about the article by the lead author on RealClimate.org) brings additional evidence of heat being sequestered into the deep ocean. They look at increased trade winds across the Pacific Ocean and model the impact of those trade winds on heat transport. Spoiler: the increased trade winds increase the transfer of heat from the atmosphere to the deep ocean and when incorporated into global climate models (GCMs) produce lower tracks for global surface temperatures. This ties in nicely with graph above that shows the dominance of La Niña conditions over the last 15 years or so. And thus we have a nice, consistent package. Stronger Pacific trade winds, characteristic of La Niña and observed in the recent period, make it easier for heat to be transported into the deep ocean, reducing the increase in surface temperatures. Really, enough said! Of course, there IS a lot more said on the subject. It doesn’t take a lot of searching to find a raft of additional research supporting this premise. Let’s go back to those model runs with flat or negative temperature trends over decade-plus periods of time (you can see them starting at about 3:15 in the video linked above). Well, it’s often asked why climate models didn’t predict the “hiatus”. But that’s not strictly true. For starters, the climate models aren’t so much predictions as simulations of temperatures given certain sets of conditions. And, as we have observed, some of the iterations of model runs DO produce periods of hiatus. So, while a pause was not “predicted”, the possibility of one was certainly present in model results. Oh, and BTW, Dr. Meehl does state that if we had had the latest GCMs and modern supercomputers (which allow the latest GCMs to run fantastic numbers of calculations), the hiatus would have been more evident in model forecasts (starting at about 10:30 in the video and expanded on in a pay-walled paper in Nature Climate Change).